It has only just turned August and I am already worrying about how I'm dressed for my training in September. I really want to ooze confidence and professionalism and right now I don't exactly have a wardrobe to reflect that. It kind of needs to change really... With that in mind, I was doing a little window shopping for some really lovely new things that could be stylish and my style but super smart and professional at the same time. Shopping around I found the cutest and prettiest shirts I've ever seen! With that, I decided that shirts could be my thing. It's one of my favourite things to wear actually because I feel like they suit me really well. And with a great pair of trousers or skirt, I reckon I could look like a right stylish yet professional gal! 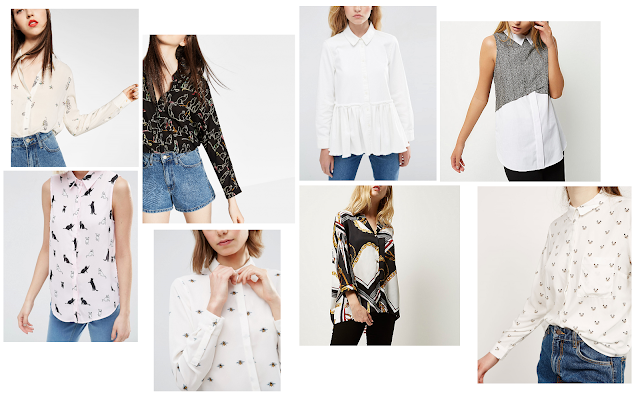 I loved how many colours and prints I found, and heck, I love me a white shirt and there are so many lovely ones out there right now. The problem is, my heart is aching with an urge to shop them all, but I can't - saving and all that you know? If I had to buy one on my wishlist today, I'd most definitely go for the rainbow cats from Zara first! I also really love the scarf print one too! Ohhhhh, I love them ALL! Does someone want to donate to Cat's work shirts fund please? Your right about you suiting shirts Cat! The drop waist one is my fave!